When I think about chocolate covered strawberries it instantly brings me back to when my husband and I were first dating. There was a chocolate shop in the area we grew up in that sold the biggest, juiciest, chocolate covered strawberries that I had ever seen. We would occasionally take time to go down to "Old Town" and window shop among the eclectic mix of stores and end our trip with a purchase of a few strawberries. They tasted amazing and you could never eat just one. The dry leaf of this tea smells overwhelmingly like strawberries and I really wished it would have translated as strongly into the brewed tea. I was really disappointed when it didn't and was surprised that I had trouble telling that there was even strawberry in it. I was once again disappointed in the quality of chocolate used in this blend. 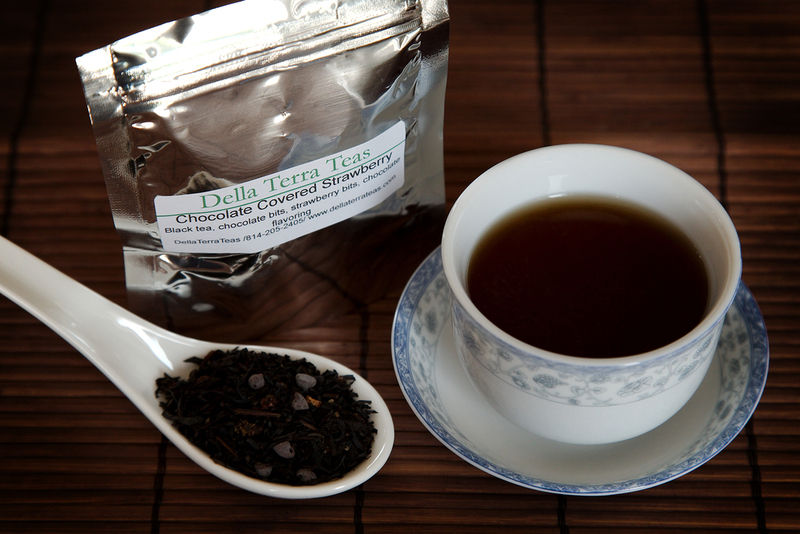 It seems to me that Della Terra uses the exact same chocolate flavoring in all of its chocolate teas and I just don't care for it. It also leaves every one of their chocolate teas tasting exactly the same. Would I order this again? No.